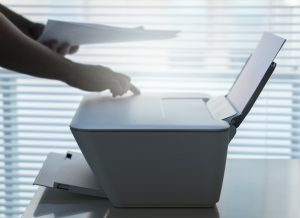 Relocating your office often means evaluating your computers, printers, copiers, fax machines, scanners and other equipment to determine if an upgrade is in order. Office equipment is essential to the daily operations of your business, but it also represents a large expense. If you’re hoping to use your move as an opportunity to trade in your outdated technology for newer models, you are likely considering two options: buying or renting. The choice you make depends on your needs, your budget and other considerations. Either way, you’ll have the equipment you need to update your growing and changing business. Buying office equipment means a large upfront expenditure. For business owners who have the budget to buy new computers, copiers, and other equipment outright, this option can be the most economical. After all, like buying a house vs. renting an apartment, you’ll be investing in ownership as opposed to funneling money into something you’ll never own. In addition, you’ll maximize your tax credits, since you can deduct each year for the depreciation of your equipment. Of course, the downside to buying equipment yourself is that you’ll have to replace it again when it’s out of date. Today, as technology rapidly advances, you may need to perform equipment overhauls more often than you may think. You’ll also be responsible for service and repair costs. Leasing is often a good option for businesses that don’t have the resources to make a large equipment purchase. You’ll make a monthly payment that is often more manageable than the enormous upfront expense of buying equipment outright. In addition, you’ll likely benefit from a service plan, as well as the option to upgrade to newer equipment at the end of your lease term. You may even be able to deduct your lease payments on Tax Day! The downside? You’ll end up paying much more than the value of your equipment over the term of your lease. For example, a $2000 copier, leased at $50 a month for five years, will end up costing you $3000 over the lease term. What choice is best for you? That depends on your company’s resources, your equipment needs and how frequently you expect to replace your equipment. Either way, an office relocation is a great time to consider your options when it comes to procuring new products and equipment. Whether you buy or rent, you’ll be making an investment in the success of your business.